I think it’s fair to say that I’ve been bitten by the ultrarunning bug. It all seemed so… much: The hours of training, the wearing out of the shoes, “The Wall”, the worry about not being a “proper runner”. Needless to say, I finished my first half marathon and was intrigued enough about what going twice that far might feel like to enter the London Marathon ballot. I didn’t get in (six years later and I’m still trying), so instead I entered Barcelona Marathon, trained hard through the winter, and finished in just under four hours. It was of course a great experience, but for me running along the straight, flat city streets for so long was incredibly tedious. I couldn’t help but think “The Wall” was more a factor of boredom than anything else, so entered a local trail marathon (Beachy Head) the following autumn and had a much more exciting time. I was hooked on long distance cross country running and completed a couple more before burning out and taking some time to relax and run without a goal. I seemed to be stuck in a cycle of getting into a patch of decent form then picking up an injury. I tried everything I could but the boom/bust process 0.continued, until (after a summer of plantar fasciitis-induced cycling) I was inspired to try some heart rate based training. This seemed to help, and I managed a few months of low intensity injury-free running. Early in 2017 I was inspired to overhaul my diet by Christopher McDougall’s excellent book Natural Born Heroes – out went the carbs, grains, and sugar, and in came the fatty meat, dairy, and green vegetables. The positive effect was apparent literally overnight, and within a week I’d lost half a stone. My energy levels had skyrocketed, and I was sleeping better than I could ever remember, waking up refreshed each morning and never having an afternoon lull. And it’s just the same today, eighteen months later. 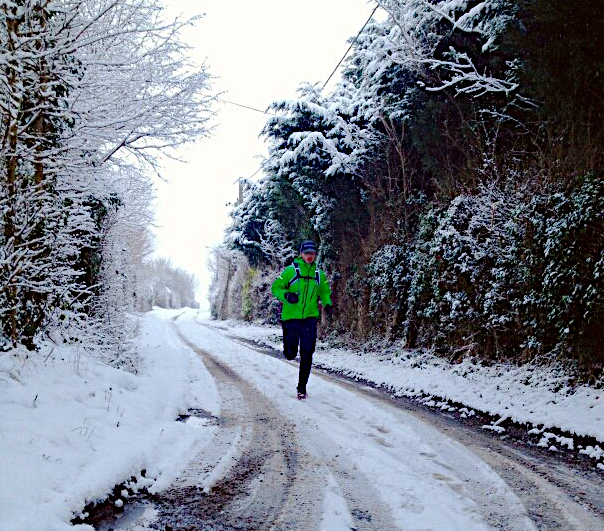 With weight shed, speed and endurance gained in buckets, and no more fear of the dreaded sugar bonk, I had a new-found confidence in my own ability and I began to wonder how it would feel to cross that threshold of 42km and push on into the unknown. 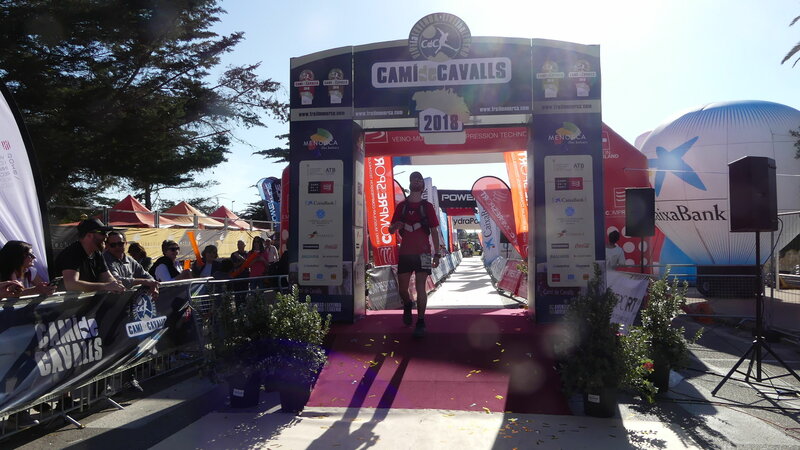 I entered the 85km Trail Menorca Cami de Cavalls Costa Sud ultramarathon and had an amazing time (you can read my race report here) – of course I was very tired at the end but suffered no injuries (beyond the soles of my feet being a bit sore for a few days). I loved every element of the race, from the pre-dawn start, through suffering in the heat of the afternoon between well-stocked aid stations, to the self-evaluation and decision-making of how I was to get myself to the line after such a long time on my feet. I crossed the line and experienced all the clichés you would expect, and enjoyed each and every one of them. I was finally an ultrarunner. Which, at length, brings me to my little trip in the Cotswolds last week. After Menorca I looked to The Alps and the UTMB week, and saw I now need an extra two qualifying points to go into the ballot for the 55km/3500m+ OCC race. I settled on a race that is a little under a week away as I write this: the Exmoor Coast 50, a 55km/2300m+ romp along the South West Coast Path from Combe Martin to Minehead. 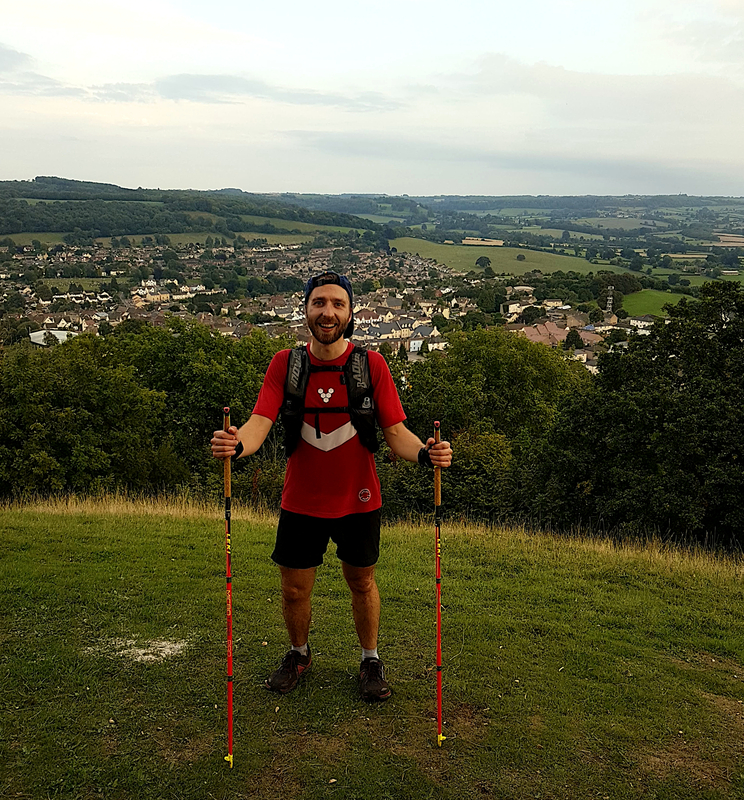 As part of my training I wanted a week of big mileage and big vertical gain, and was fortunate to find the time for a two day trip to the beautiful Cotswolds in the same week I was due to travel to Switzerland for work. 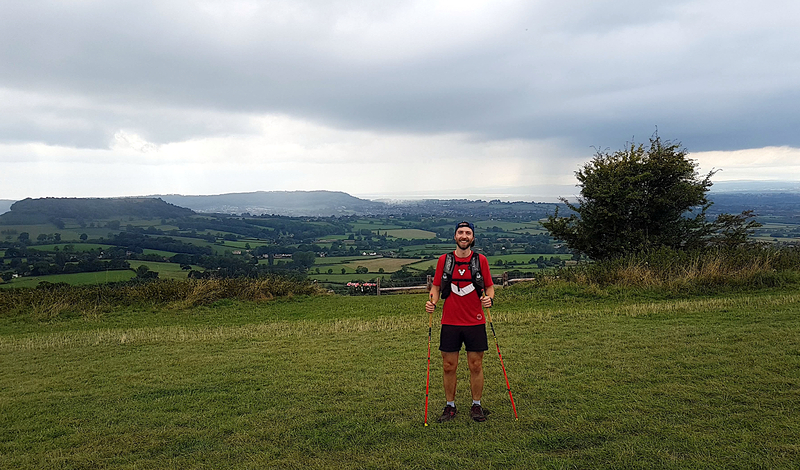 I settled on the bottom half of the Cotswold Way (CW), running south from Stonehouse to Bath – I’d do back-to-back long runs and stay overnight with my friend and colleague Philip Mackenzie, who has for some years reminded me that the trail runs right through his back garden. It looked to be around 32km on day one, and a marathon-or-so on day two. A cancelled train from London meant I was a little behind schedule beginning my journey, but with plenty of time to meander through the countryside to my destination beyond Wooton-under-Edge I didn’t need to rush. 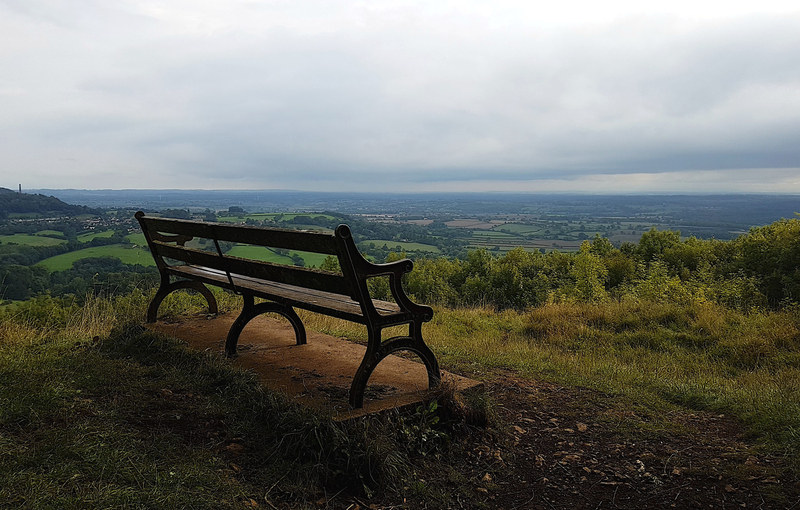 The opening kilometres through Middleyard and Stanley Wood took me to Frocester Hill Nature Reserve, with far-reaching views over the Severn basin and into Wales, and into the small town of Dursley where I could restock my pack. There was the opportunity to take my time, chat to the locals, and enjoy the first few hours of flowing trails and minimal suffering. After Dursley there is an optional 3km loop over to the western edge of Stinchcombe Hill, which is well worth the effort for more expansive views into Wales. 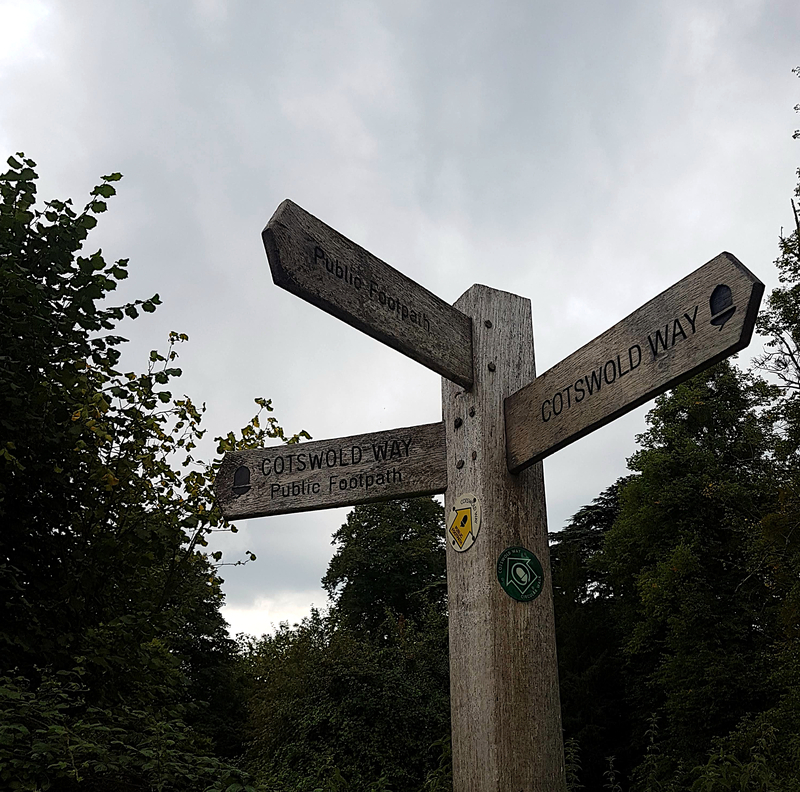 The path is in general very clearly marked and I didn’t often need to check the map – however there is always the odd moment of inconsistency on a long distance route, and one of these lies between North Nibley and the impressive William Tynedale Monument. The CW would appear to follow a steep track straight up the side of Nibley Knoll, but there is no clear path or signage and I found myself bushwhacking with my poles to eventually make it to the top. Another issues lies beyond Wooton-Under-Edge, Where the footpath doubles back on itself by Warren Farm – stay high above the woodland to the left of the fence, as if you follow the green dashes exactly you’ll find yourself with a perilous scramble up a steep, wooded bank to rejoin the CW at Workham Plantation. After these delays, I finished my first day’s run at 36km and just under 1,150m elevation gain – a big effort for me, but there was much more to be faced the next morning. I caught up with my friend, had far too much to drink, and went to bed feeling positive about what was to come. I awoke to the sound of rain lashing against my bedroom window, but with a train to catch from Bristol in the early evening I had no chance for a lie-in. My legs felt alright – certainly much better than my head – so after a large coffee and some breakfast I headed out and into the damp September morning. Getting going was hard work, but I settled into a slow plod and was pleased to find the weather was much clearer above the valley. Shuffling my way through a string of picturesque Gloucestershire villages and across the stunning Dodington Park Estate (belonging to James Dyson – he of vacuum cleaner fame), I was happy to take my foot off the gas and chat to a selection of interesting characters as they also made their way south to Bath. I experienced moments of great pleasure on such a beautiful and peaceful trail, although these were always followed by waves of hangover reminding me why Metaxa is not normally a session drink of choice for a long night. The human mind is a strange and wonderful thing. 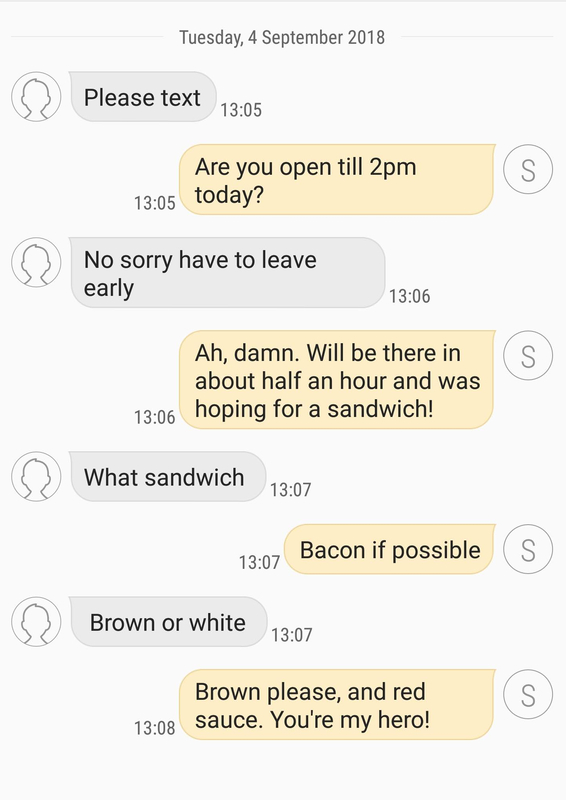 As I crossed the M4 and began to make my way southwest towards Dyrham, I spotted a layby of the motorway and became fixated on the idea of there being a roadside cafe to make me a bacon sandwich. And of course, try as I might to tell myself that there may not be one, my disappointment on discovering only parked cars was close to crushing. Then my fiancée phoned me saying that my dog had snaffled some fruit cake off the table and was on his way to the vets to have his stomach emptied, and I saw that my grumpiness was not worth sustaining. I was saved, and the following four kilometres were my fastest of the whole trip. 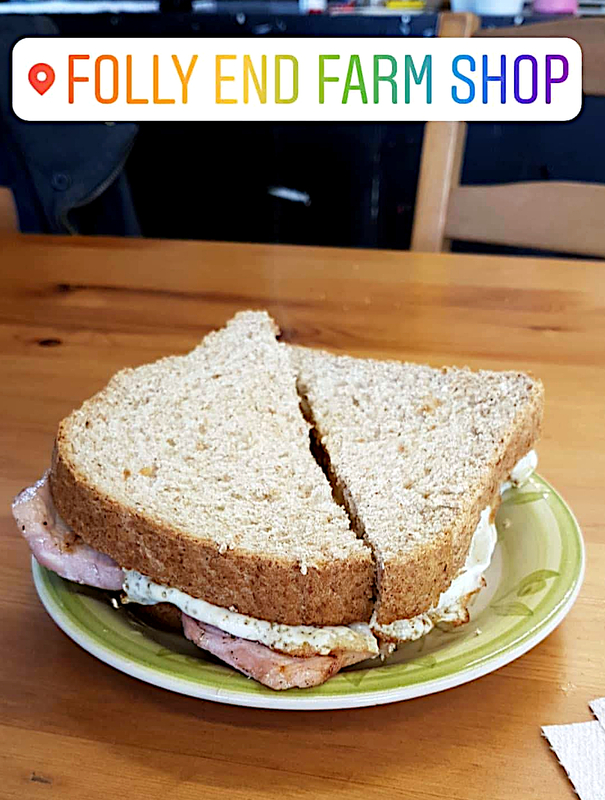 I piled through the door with only a few minutes to spare, panting and dripping with sweat, and let me tell you it was the most satisfying bacon sandwich of my life. Thank you Cold Ashton Farm Shop, that day you were my saviour and one true love. To anyone reading this who may find themselves near Bath: Go there, spend all your money, and think of me. They deserve it. 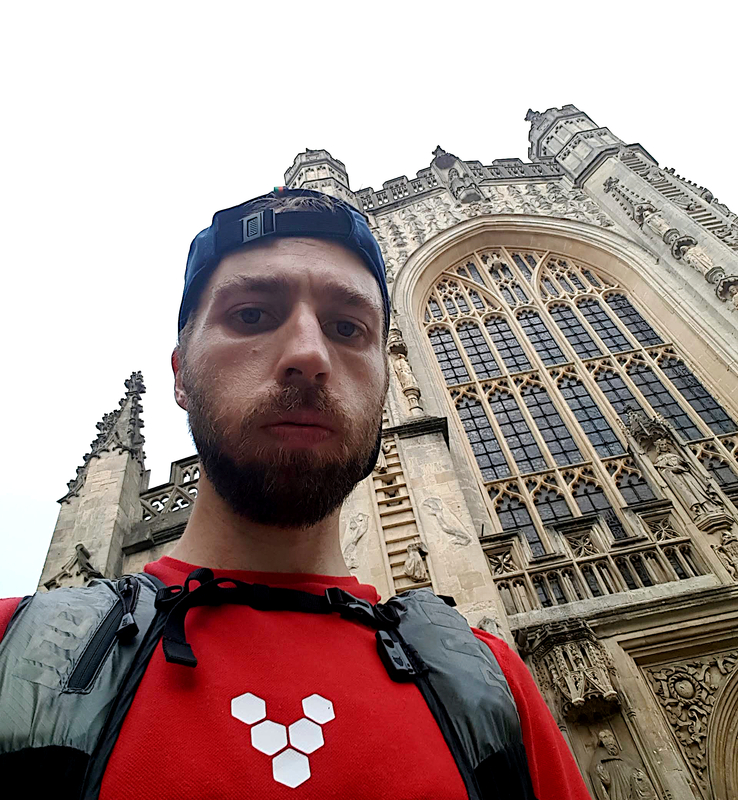 The final kilometres into town were a slow and steady combination of hiking and jogging, taking in civil war battlefields, Bath Racecourse, and a number of the city’s beautiful parks and fine examples of Georgian architecture. I’d been on my tired feet for almost seven hours and finding myself amongst the tourists and traffic was a little overwhelming, but it was a wonderful feeling to finally touch the walls of the Abbey and slump down into a chair at the burger bar for some food and a rest before my train back to London. I’d covered 45km with 930m ascent, making my total for the trip 81km with over 2,000m vertical gain. Later in the week in Switzerland I ran a vertical kilometre up most of Mount Pilatus, which helped me to achieve my target of my longest week – 108km/3,000m+. 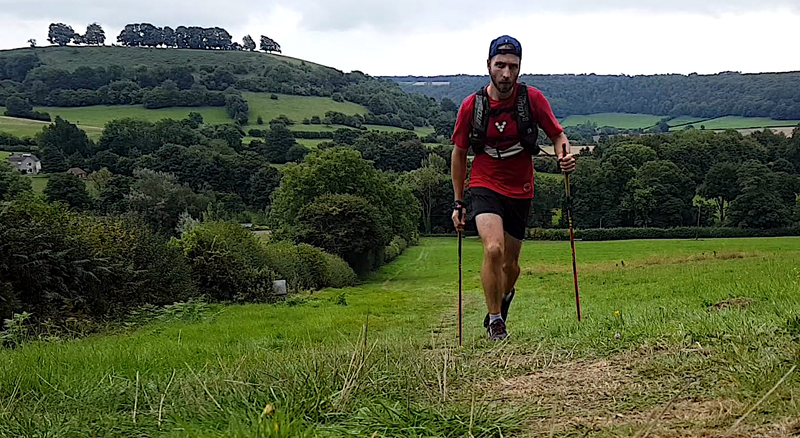 I’m feeling strong, and I’m ready for what my the Exmoor coast path can throw at me – onwards and upwards, in the amazing adventure that is ultrarunning.